Lucius Burckhardt once described the household as an “accumulation of implements [and] a playground for design” (1). To Roselyne Titaud, habitations are a playground of objects: and, in addition, an expansive field made up of relationships, tensions, juxtapositions, and contradictions. She comprehends private space, and in particular the objects that constitute it, as a composition, and has made it her artistic task to re-investigate this composition over and over, in order to explore it with her entirely unique gaze and to make it portrayable. Given their aesthetic – she photographs in color and chooses a rather rare image format, namely the square – the photographs aim less at an analytical or sociological observation of the object: the topos of “person at home,” as we find it with Michael Schmidt or Christian Borchert, is not her concern. Her concern, rather, is concentration on details and niches, looking at the trivial in order to provide information on the constitution of the bourgeois private space. She follows a clear typology in doing so: she observes only the middle-class home and makes sure that the living spaces exhibit a structure that’s grown over years. Following this pattern Titaud’s photographs walk a marvelous tightrope between two forms of observing. On the one hand, we have an empathetic look inside domestic intimacy and, on the other hand, the objects as they reflect the gaze and look back. This game of alternately diving in and rebounding plays out particularly through the balancing of materiality and surfaces: for our gaze is allowed to fall – and it literally does fall in a wealth of beguiling opulence, indeed it positively plops into the padded quilts and sofa cushions, plush armchairs and flowered wallpapers. However, with the dropping begins the buoyancy, too. The gaze slides down on polished tabletops, lacquered display cabinets, polished mirrors, and plump leather sofas; it’s positively catapulted out of the picture or pointed toward spatial elements beyond the image detail. In these photographs, admission and ejection are closely consecutive. However, this may be due to the theme, to the interior motif, as well; to that surface of which one never knows exactly how much it really conveys. Titaud’s interiors look predominantly as if they were from another time. Even more than this, though, they appear as spaces that present themselves as “quasi-finished places,” or as spaces that have been furnished over a lifetime. They have arrived at a point where it’s all there and it’s barely necessary to change a thing. They are still lifes in action, if you will. Still lifes that are used and on whose arrangement, presumably, time has had an equal say along with their designers’ will. (1) Lucius Burckhardt, “Design ist unsichtbar,” in: Jesko Fezer and Martin Schmitz (Eds. ), Lucius Burckhardt: Wer plant die Planung? Architektur, Politik und Mensch, Berlin 1980, p. 191. There’s no-one anywhere. And signs of people everywhere. Jesus on the cross surveys the spick-and-span dining table in a convent. Do the nuns, as they sit down to eat, take a quick look at themselves in the gleaming table? One look, too brief, too vain, too stolen, to be heartening? Perhaps. If nuns still live in this convent at all. All the indications are there; yet we don’t know how long time’s been standing still. In the spaces in the pictures by Roselyne Titaud. Here prevails a quietness that’s disquieting. Deceptive. Everything appears to be waiting for things to continue right away. At the same time, one feels that things haven’t been continuing for a long while. Is this because the objects visible in the pictures belong to a past era, point to a generation that’s already old – that perhaps is no more? Perhaps. Perhaps the feeling of moving behind or alongside time, though, also emanates from the things themselves. Objects get older, without moving. Time stagnates in them, they become witnesses, bearers of the traces of that which has occurred around and with them over the years. Many a depicted armchair practically bursts from all the pleat-protected, vest-covered posteriors that have buried themselves in it. And more than one candle betrays the fact that it has been standing aslant a long time. That it has become accustomed to standing aslant, to not being set upright, by its proprietress. Or its proprietor? A widower? An old married couple, one of whom is no longer able to get around so easily, spending most of the time on the sofa and, from there, contemplating the sideboard, with the flowers and the photos and aforementioned candlestick? By stopping time, Roselyne Titaud’s pictures begin to tell a tale. They point beyond themselves, lead us to that invisible thing that’s possibly happened or is still happening, to an abundance of possibilities that we can only see, experience, before our inner eye. Roselyne Titaud shows us this abundance of possibilities calmly, and not uncommonly with a wry smile. Her gaze discloses, but never exposes. It doesn’t make itself complicit, but trusts instead to another force, to the one and only assistant Roselyne Titaud needs at her work: light. Natural light, falling on things anew every day. This undirected, not artificially generated, but found light creates the dramaturgy in her pictures, it accentuates or obscures, while Roselyne Titaud, as she puts it, with her camera merely gives this spectacle “a frame.” As soon as she enters a room, she sees what the light’s falling on and then usually fairly soon knows where her standpoint is going to be, where she is going to position herself in relation to the room, to the light and to the objects. The rest is setting and operating the camera. Is this why her works are so simplistically innocuous and enigmatically dramatic, so eerily calm? Two dolphins on the sideboard leap for air. Dried flowers try desperately to approximate the charm of their authentic prototypes. Futility: touching and oppressive. Unsettling are the eyes of a toy owl, gazing unusually watchfully into the room, looking too lively to be not real. A dining table in the dark room, photographed from out of the darkness. Like a glimmer of hope the forest landscape outside glows, but seems beyond reach behind the firmly closed windows. This is a picture that gives you the chills if you look at it too long. Roselyne Titaud’s pictures are not obviously metaphorical, they don’t interpret, they don’t seek the symbolic, what goes beyond the object. Instead of this they cast a new light on the object itself, they reveal the beautiful shape of a radiator, the exuberant force of a creeper: its growth has almost a subversive effect amidst so much arrangement. Roselyne Titaud’s pictures demonstrate man’s need for order, oversight, control. And they show what escapes this control: the wind, that makes the curtains billow, that defies the boundary drawn between inside and out. The four elements water, fire, earth, and wind are banished as far as possible from these spaces, from the constructed civilization, but with the wind this succeeds the least. And the light, too, the wandering light, shows us that life ultimately means constant movement. This is a discovery that’s easier to bear if one can be sure of the well-tried armchair that stands ready for falling into. Who knows for how long already. That the dwelling belongs to humans, defines them, gives their life a shape and allows them to sleep quietly at night, is shown us by Roselyne Titaud’s pictures; just like the fact that nothing is only the way it seems to be. Each space harbors something invisible, it waits for that “ange qui passe,” as the French call it, that invisible angel who wanders through the rooms. And even in the moments the angel doesn’t pass by, these rooms are not empty; on the contrary; in them collects, gathers, a wealth of possibilities, of stories, past and future, real and imaginary. Roselyne Titaud captures this infinite variety, she makes the invisible tangible, leads us to the nun who bashfully winks at herself in the dining table. Perhaps. Life vanishes; with it, so do things, and then also the light in which we saw everything that was shone upon. 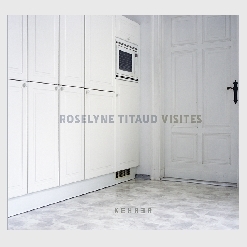 The starched bedding, smoothed after the farewell or creaseless for the expected guest; the reflective veneers of the tables, spotless without cloths; the folds of the armchair, occupied by shaded light; the only once-lit candles; the waxen fruits in the bowl; the flowers that outlast all light – Roselyne Titaud photographs spaces that have been provisionally quitted as though they were pre-ordained to be photographs, frozen into images whose just-died time, though, at this moment, just for this moment, she is trying to rescue. Her visits to people’s rooms in France or in Berlin tease out the time that resides in the objects and has remained there for the moment of eternity of a domestic life. Objects prevail, they dominate where life has retreated from them, moved out of them. Our whole lives we take photographs and keep the pictures, so the life in them, the “forgotten human element” can be touched still, can be felt still. Here the absurdity in photography also lies: it is that, in it, we seek to preserve what has faded in its light. The house is our corner in the world; there we once nested, it says in Gaston Bachelard’s The Poetics of Space, and Roselyne Titaud is a protector of this intimacy: she takes care of the spaces with her gaze, the found detail from the little world, and the chosen light. It is the objects – present or beyond the field of vision – that create the space, in the arrangement of their story; they are arranged for seeing and feeling; in them, life with them was once intended and lives on with us still. What good would it be if I indicated the layout of my room and the place of the things in it, Bachelard said, and only I, I alone could open the drawers once more or the door of the cupboard, feel the wax cloth that covered the letter trays, and, from far way, invoke the smell of wood and time, the freshness or the dust, sense the wind in the curtains or hear the creaking of the bed. Memory knows no empiricism. And if this candlestick, that vase or this blanket have been produced a hundred thousand times over, here they become unique items and appeal to us. Roselyne Titaud’s photographs visit spaces that all have memories inscribed in them, not only of those who live in them but the artist’s memories of her rooms, too, perhaps somewhere in a château in France or even just a little house, but with old, thick wallpapers, rooms in which her grandfather Raymond, to whom the “Visites” are dedicated, also lived. In these images every identity bears an intimacy which one can approach only with closed eyes and in consciousness of one’s own feelings, memories, and stories. Roselyne Titaud may be standing in the light of another time, but she has bestowed upon the spaces and objects she photographed an association with other spaces through which we, as others, have walked.